OK, still testing out the new blog system. Seems to work pretty well. I'm at Good Measure coffee shop in Louisville not far from home. 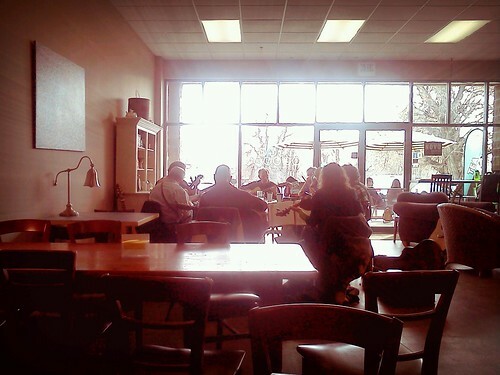 There's a group of 9 guitarists here gathered around a long table trading songs and strumming away their Saturday afternoon. Yesterday at the end of the day I scrambled to get our new code deployed and then record screencasts for our weekly demo video, get the summary email out, and then scamper out the door to get to The Spot for a bouldering date by 6pm. I bouldered with Shannon for a solid 2.5 hour session. We worked on some tough and interesting problems that we couldn't ever quite conquer. Then it was on to Chez Thuy for delicious Vietnamese food. This morning I had leftovers from the meal and the peanut/shrimp sauce with veggies, pork, and brown rice was so delicious that I was almost moved to tears of gratitude. It might be time to relax the diet a bit more I think. There's at least 3 fun things happening tonight, but I haven't decided which if any I'll be attending. Tomorrow more busking with Gora Gora Orkestar. This afternoon I'll be doing a little hacking here at the coffee shop and taking care of some errands.